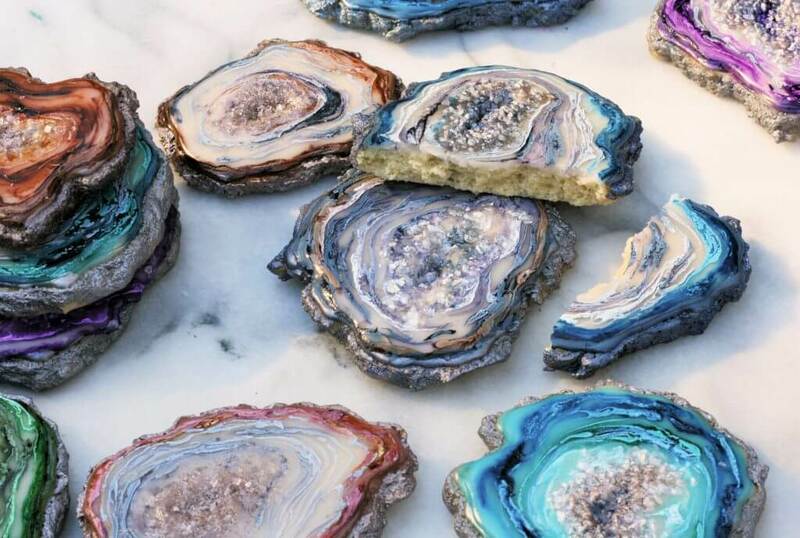 All that Glitters: Add a touch of sparkle to your dessert table than with these glittering agate slice cookies by Lyndsay Smitke. 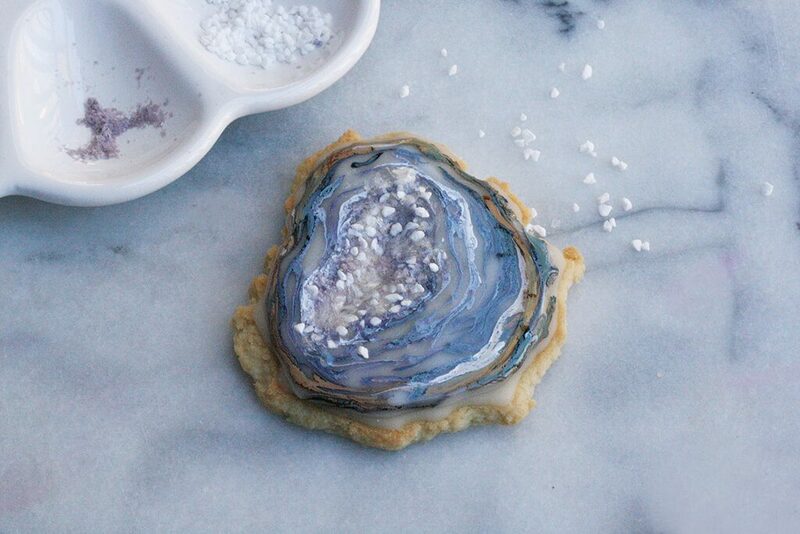 Combining the huge trend for agate and geode inspired desserts and her passion for cookies, Lyndsay shares this wonderfully effective and easy tutorial. Your guests will be doing a double-take when they see these stunning cookies. 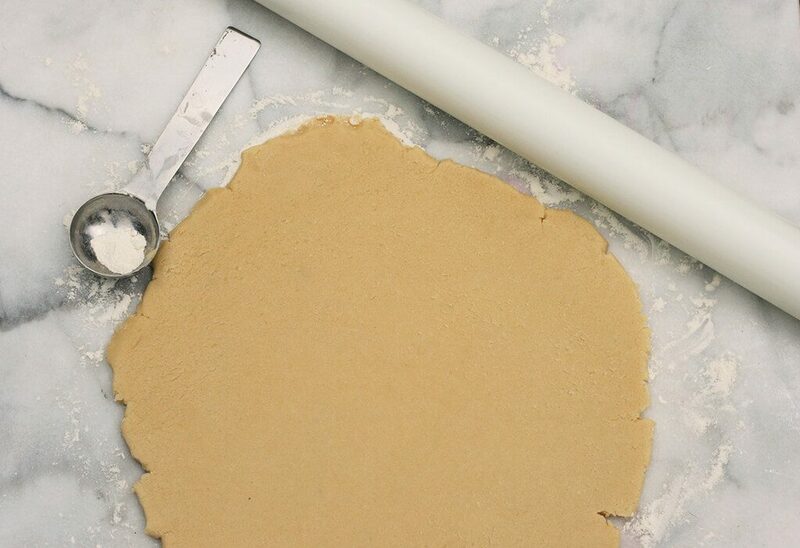 Prepare cookie dough in advance and chill for 1-2 hours in the refrigerator. Roll out your cookie dough to about 1/4 inch thick. 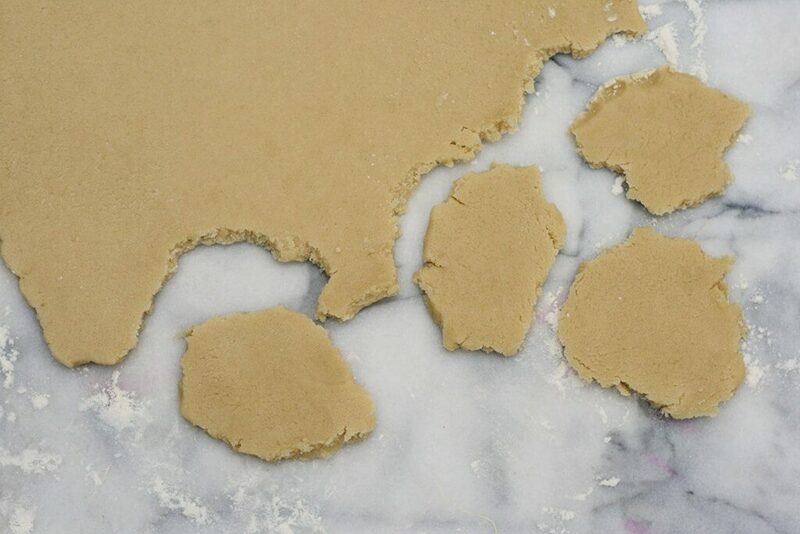 Tear the dough into loose oval shapes to create your cookies. 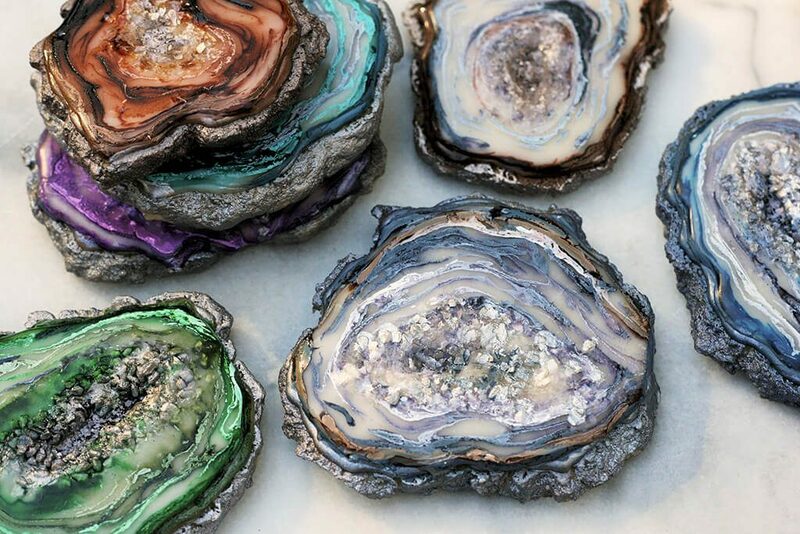 Lyndsay notes: This will give your geodes a more organic natural look. 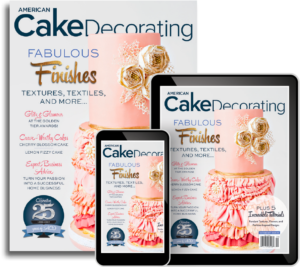 While cookies are baking and cooling, prepare your royal icing/glaze, and assemble your materials for decorating: lemon extract/Everclear, food colors, lusters, glitters, sugars, toothpicks and paint brush. Ice cookies with a flooding consistency royal icing or a glaze. Lyndsay notes: I prefer glaze icing, as it gives your geodes more of a glass-like finish. 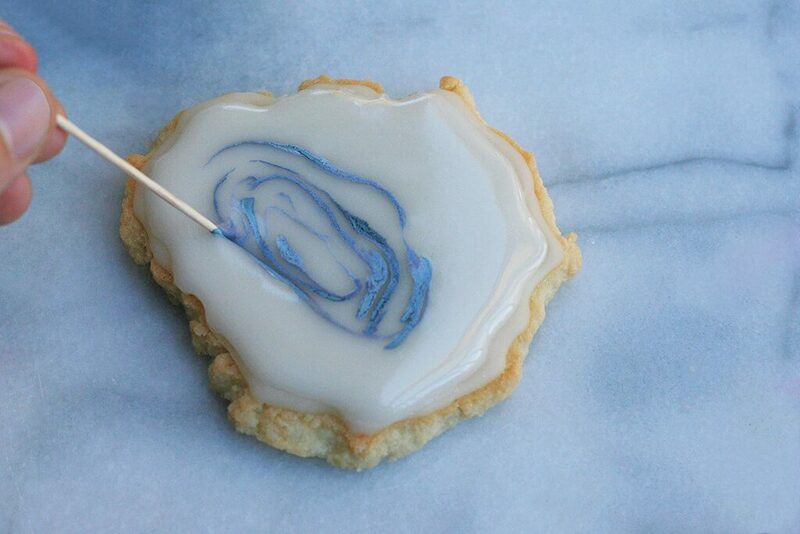 Using a toothpick dipped in your preferred gel colors, run the toothpick through your icing in a circular pattern, creating a natural agate pattern. To make them look more realistic, use different shades of your chosen color and follow the natural shape of your torn cookie. Lyndsay notes: for inspiration use a photo for reference. 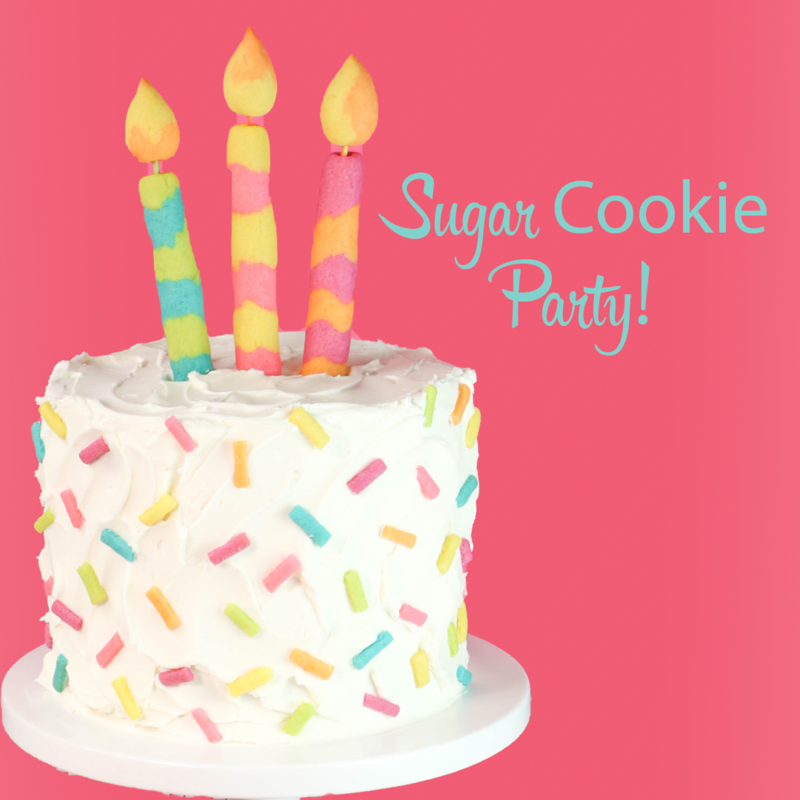 Before your icing starts to dry, sprinkle some sugar crystals and edible glitter in the center of the cookie and press down and out a little to create the cavity of your rock. Lyndsay notes: Once decorated, let your cookies set for at least 30 minutes. 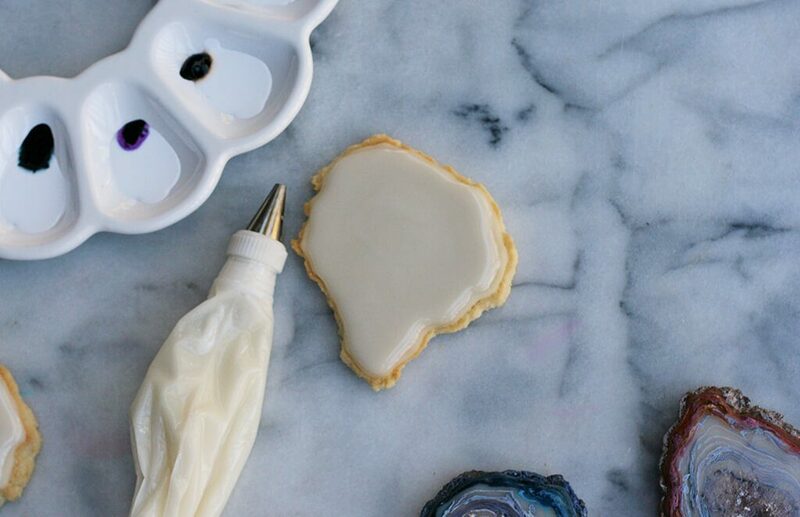 To finish the cookies, mix some edible luster dust with lemon extract or Everclear and paint the outer edges of your cookies to make your agate cookies look even more realistic. 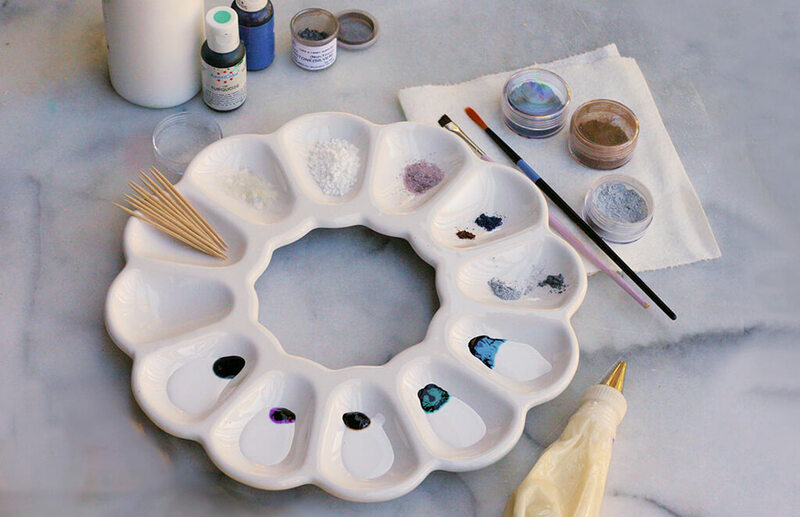 Use your glitters and luster dust to paint in the cavity of your rocks to give the illusion of crystals. Lyndsay notes: Add darker colors at the very center of the cookie to create depth. Let your cookies air dry for 24 hours if you will be stacking them. Lyndsay has been creating cake and sugar art for six years. 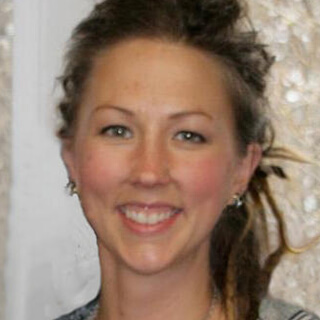 Lyndsay, who is the wife of a soldier, relocated her business to Duluth, MN from Kentucky in 2016 after a military change of station. 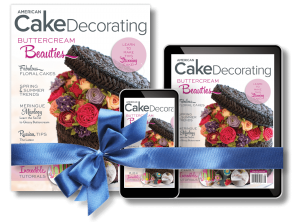 Her business, Snazzy Cakes, is known for creating custom cakes, cookies and cupcakes, with a reputation for Lyndsay’s signature creative touch and perfectionism.